In the Alaskan Bush, residents depend on products to be tough, durable, and long lasting. 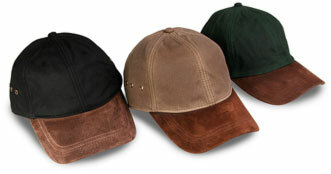 The Alaskan cap has all these rugged characteristics, plus a unique and individual look. This cap is constructed of heavyweight waterproof oilcloth imported from England. We have added a brown oiled leather visor, and antique metal side eyelets, making this cap one of the most desired caps in our line. Available Colors: Black, Brown... Please specify color.